Personal injury matters when it affects your life. 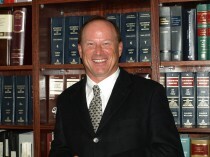 That is the driving philosophy of James A. Heuer, Jr., principal attorney at Heuer Lund & Flores, Attorneys at Law. Heuer and his colleagues at this Minneapolis based law firm have a clear understanding of how injuries affect the lives of individuals, as well as how the laws, the courts and insurance companies work. Jim is known to his friends, colleagues, and the legal community as “Heuer the Lawyer”. Heuer himself once worked as a claims adjuster, investigating the details of accidents on behalf of insurance companies. After attending law school, Heuer switched sides to working for individuals and the families of individuals who have been injured or killed as a wrongful death attorney in Minneapolis. For the better part of three decades, he has consistently worked on behalf of those who were injured and suffered losses — and has helped many clients receive fair compensation for those injuries and losses. James Heuer also speaks both English and Spanish. James Heuer understands that a wrongful death can cause an unparalleled level of grief and pain for you and your family. As a result, when you seek help from Heuer the Lawyer, he makes every effort to provide you with personal and timely assistance. Like everyone at Heuer Lund & Flores, James Heuer works tirelessly to help injured parties and families who lose a loved one move on with their lives.